Nothing warms the soul like a bowl of homemade bean soup. 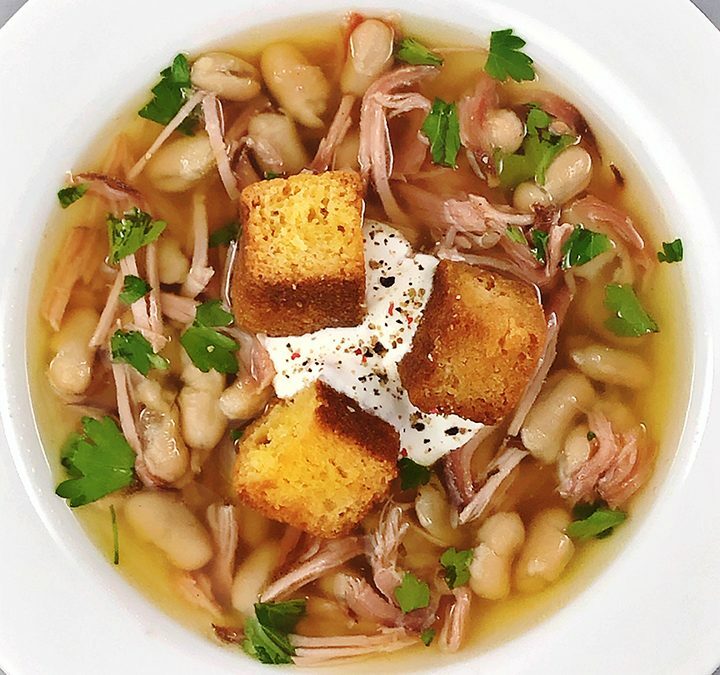 A rich broth filled with white cannellini beans, shredded ham, and fresh cilantro topped with sour cream and cornbread croutons. It’s an all-time favorite comfort food. Heat the olive oil in a large saucepan over medium heat. Cook the leeks, celery, carrot, and garlic, stirring frequently, until tender and golden, about 10 minutes. Add ham bone, parsley, bay leaves, and peppercorns. Cover with enough water to rise about 1″ above top of bone. Simmer, uncovered, for about 3 hours until the stock is flavorful and fragrant. Strain the stock through a fine-mesh sieve into a large bowl; discard the solids except the ham meat. Shred the meat and add with the beans to the broth. Cook for another 30 minutes. While the soup cooks, preheat the oven to 375˚F. Cube the cornbread. Brush the cuts side with butter and bake in the oven for 10 minutes.